During endoscopy, various benign esophageal lesions are encountered in the esophagus. Most are asymptomatic and have no malignant potential. These various benign lesions can originate from different layers of the esophagus. According to their origin, esophageal tumors can be classified as epithelial and subepithelial tumors (SETs) (Table 5.1). Papilloma is the most common epithelial tumor in the esophagus and shows small, whitish-pink, wartlike exophytic projections on endoscopy. Although SETs originating from the superficial layers of the esophageal wall can present with characteristic endoscopic findings such as yellowish, molar tooth-shaped appearance in granular cell tumor, the lesions originating from deep layers such as leiomyoma or gastrointestinal stromal tumor also show similar morphology on endoscopy and even on endoscopic ultrasonography (EUS). Therefore, sometimes it is difficult to determine the histological origin of the tumors endoscopically. 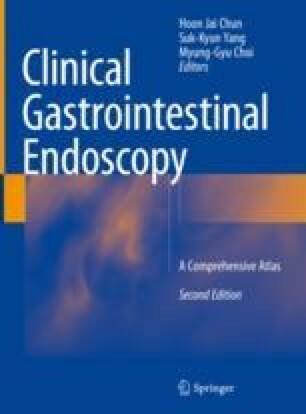 In this chapter, endoscopic findings of various types of benign esophageal tumors will be discussed with examples. Special thanks to Prof. Jun Haeng Lee for providing wonderful photos.